* Open this map full-screen for additional functionality. The District provides air quality information from its sites and simple report tools for public information with the map tools, above. This data is displayed by default as the r Air Quality Index format on the map. The AQI value is different than the measured value which is used to calculate attainment of air quality standards. Please note that because this data is displayed in real time it has not undergone QA/QC. During monitor maintenance or calibration, the values may drop, spike, or be absent. 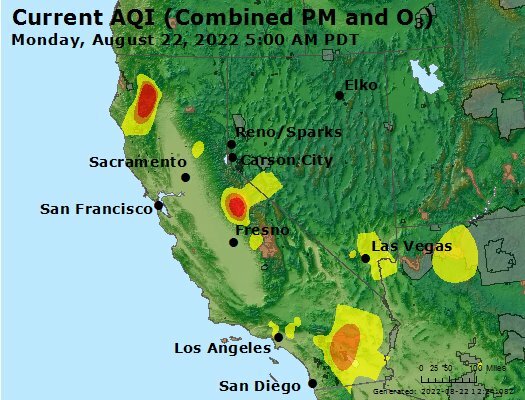 PLEASE NOTE: District monitoring, depicted on this map, is for PM-10, a regulated pollutant; but not the primary constituent of wildfire smoke, which is PM-2.5. Please see the Wildfire and Smoke Resources on our community bulletin board page and review our guidance document regarding online tools for PM-2.5 and wildfire smoke. EPA has assigned a specific color to each AQI category to make it easier for people to understand quickly whether air pollution is reaching unhealthy levels in their communities. On the local map: hover over the AQI legend for more information on each color code/category. Click on a site for expanded information. Select the link below the map for a daily graph report of all 4 sites. The District has three particulate matter (PM-10) and one ozone (O3) site. The PM-10 sites are located in Healdsburg, Cloverdale, and Guerneville. The ozone site is located in Healdsburg.